This tutorial series will help you learn Load Runner from scratch. We have covered the latest VuGen scripting tutorials in greater depth with many easy to understand examples. Note – We have updated all the VuGen tutorials with the latest examples on Micro Focus version! The video tutorials are recorded on earlier HP version but these are still completely valid with minor UI changes which you can spot easily. 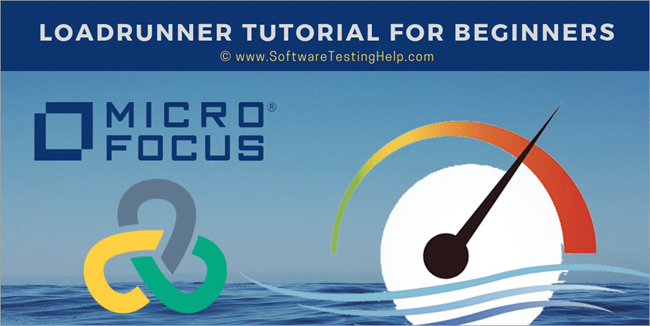 Micro Focus LoadRunner (earlier HP) is one of the most popular load testing software. It is used to performance test an application under the load. This LoadRunner Tutorial series will help you learn the tool from scratch. ‘VuGen’ is the first component of LoadRunner and is used to capture the network traffic and create scripts that emulate real user actions on a Web Application. This tutorial will explain you all about VuGen Scripts. Script recording allows various options for selection on how the script is to be recorded. This tutorial explains about the various Script Recording Options in LoadRunner. This tutorial will explain Vugen Script Recording and replay process in detail and you will also get to learn how to handle dynamic values using ‘Correlation’. This LoadRunner VuGen Parameterization Tutorial will help you to learn Parameterization in detail along with the types of parameters and the steps involved in Creation and configuration of parameters. This tutorial will explain you all about VUGen Correlation and how it works in detail along with an informative video for your easy understanding. We will see the basic VuGen script enhancements like Transactions, Text and Image checks, Comments and Rendezvous points in this tutorial. This tutorial will guide you on How to handle some real-time challenges in VuGen scripting along with few other other scenarios that we would come across while working on various applications. We will learn more about ‘pre-defined’ LoadRunner, Protocol specific and C-language functions with synatx and examples that are most commonly used in VuGen scripts/scenarios in this tutorial. In this tutorial on Web Services Performance Testing Using LoadRunner, we will learn how to Create SOAP Web Service Scripting using Web Services protocol with VuGen. Learn how to setup LoadRunner VuGen script files and Runtime settings to create or enhance any VuGen script for web applications from this tutorial. Test Result Analysis and Reports in LoadRunner are explained in a simple step by step manner along with a classic video tutorial for your reference. This tutorial will focus on the most commonly asked LoadRunner interview questions and answers that will help anyone to successfully clear the performance tester’s interview using LoadRunner. Check out the complete series and let us know if you have any questions. First Tutorial in the series. Could you please help installing loadrunner? I read all your blog posts and those are very informative for all QAs. I find these tutorials very useful and easy to understand. thank you. THIS IS THE BEST WEBSITE FOR ANY TESTER. Do you need to know c programming before you start with loadrunner. I used it on a basic level for about a year when I was working in a Data Center. Was thinking about getting back into it. Thanks for the wonderful videos for Load Runner. Can you please do the same for Selenium ( open source tool) it will be very helpful for us. Could you please do the same for JMeter( open source performance tool). which version of loadrunner (like 9 or 11) r u used for creating these videos? @Sunny- The version of LoadRunner is 11.0. When i try to install LR 11.50 in window xp, my installation is not complete i fetched the below error. plz help me how to install LR. Hi,thank u for the valuable information. Can u pls let me know where to get LR tool for practice purpose.Is there any trail pack? Verify helpful for a beginner like me. Thank you guys for hard work. Wishing you all the best. Is LoadRunner free available at any site? can you please send me link of that site. Would you please help me to record the web(HTTP/HTML) script in VUgen LR11.5 . Vugen is not recording any events. Your LR videos are excellent but it is missing the main CONTROLLER video, without this video the session is incomplete . Please upload the controller tainting video as soon as possible. Thanks for the good work. @ Azhar- Thanks for appreciating our work. Please find the Controller video. Due to some technical issue it was not visible. please tell me where i can download loadrunner for linux 32 bit and 64 bit. Thanks a lot for your tutorial videos. I want some help regarding HP Loadrunner 12. I learning loadrunner and have dowloaded the latest trial version from the hp site. I have been trying to find the sample application but not able to do so. Can you help please? Hi Chetan, Thanks for the tutorial. Can you guide me how can i get some hands on experience on Load Runner..
i want to know, whether loadrunner supports MAPI performance testing ? I want to install QTP and Loadrunner in my Laptop so can you send me a link to download this softwares compatible with wind7. Nice efforts, I am waiting for Jmeter tutorial (open source). anything about Jmeter will be lot for me. Chetan, thank you for sharing your LoadRunner knowledge and expertise. I am new to testing, therefore ,the tutorials helped with understanding how to navigate and why. I will now be able to be productive early in the new tester role! Thank you! thanks for the tutorial links. very much useful for a beginner. Being an avid follower of softwaretestinghelp.com,request you to introduce extensive jmeter tutorials from beginners point of view to expert level. Need some help regarding Mobile HTTP/HTML protocol in Load Runner 12.50. What am doing : Just wanted to record the scripts via proxy recording method,for Mobile HTTP/HTML protocol. My Vugen Machine and my mobile device is in same wifi network.Then I changed my Mobile wifi settings to manual and added my Vugen machine Ip address(IPv4 address of my laptop) to proxy server and changed the ports to 8282 (common ports)on both devices to capture the activities that I am doing on my device. Then I clicked ‘next’ to start recording but VUgen not capturing any transactions. I used google chrome browser for transactions in mobile (Nexus 9 Tab) and also tried deleting all cached files from mobile and laptop, unable to find any solution yet. The same above process I have tried in JMeter and its capturing all the activities fine. Could you guide me regarding this issue please. Need online course on HPLoadRunner. Pl. provide all the details. Like WBT, ONline, classroom , schedule, duration, fees etc. very nice , learn lots of things about loadrunner with ease . Can you please help me in installing HP load runner.While installing , i am not getting “Prerequisites software” window.And installation process stops. Hello, this is snehal, i am working as a software tester(manual). I have 1.5 year of experience. I am working on web applications. Now i want to learn new things in testing(automation) related . Please help me out to choose field for my career. Qtp, selenium, agile…? ?